I left Heathrow in the late afternoon and arrived at my hometown Saigon, now called Ho Chi Minh City, next day mid-afternoon. The airport is in the city and is only about 20 minutes from the centre of Saigon by car/minibus depending on the traffic. 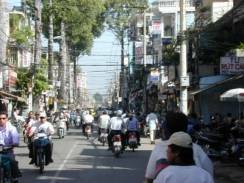 The very first thing you will notice in Saigon are the hundreds and hundreds of people with motorbikes on the road. There seems no right of way in driving, so the motorbikes ride around freely like a mass of fish in the ocean. Like the fish they swim around you to miss you altogether. The sound of hooting is continuous and repeating in your ears. It's the life and people of Vietnam. We checked in at the 2-3* Vietnamese run Mondial Hotel at the centre of Saigon. A 5- storey small hotel with 40 rooms designed tastefully. The hotel is decorated in Vietnamese style. The rooms are clean and comfortable. The location of the hotel is at the heart of all the beautiful shops and restaurants but the peaceful and restful of the hotel interior remains uninterrupted. Our first excursion was a day trip to the Mekong Delta. It takes 2 to 3 hours to drive from HCM to My Tho, the usual first stop in the Delta. The rural unspoiled daily life of the river comes into view, the Stilt houses, the floating vegetable market for local trading, the dishes being washed in the river, the women washing clothing along the river bank, the children bathing on the waterway canals, these are all to be seen on your boat trip on the river. A delightful lunch of prawns and fish is included in the flower garden restaurant along one of the waterway canals. The green and lush scenery along the river and canal waterways gives you a profound sense of calm and relaxing enjoyment. A longer stay of 2 to 3 days in the Delta can be arranged for your itinerary. A very pleasant way to see the Vietnamese country river life as I remembered it unchanged for the last thirty years. 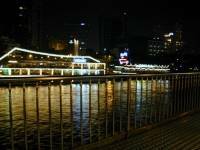 An evening Saigon River Cruise ended the first day tour most enjoyably. Two hours gently cruising along the famous Saigon River with dinner served and traditional musical entertainment. The fried squid with chilli sauce was particularly good and memorable, washed down with cool and refreshing Tiger beer. The scenery changes from the light and sounds of Saigon city to the dark sleepy river along the way passing several naval ships on the outskirts of the city. The other side of the river was quiet and dark sleeping into the night. On the second day, the HCM city tour covers most of the famous sights, Notre Dame Cathedral, Lam Son Square, The Reunification Palace, Ben Thanh Market, the Chinese district in Cholon and Binh Tay Market. The best bargains to buy are shirts, t-shirts, shorts or trousers in the Ben Thanh Market. I bought two Vietnamese style short sleeve shirts for $ 8 US and some shorts for $2 US. Please remember to bargain down the opening prices from the very charming and pretty Vietnamese girls on the stalls. The food stalls in the market were full of mouth watering Vietnamese dishes but remember only to eat anything cooked and very hot outside the hotel and only drink from bottles or cans without ice. Do not try the Vietnamese way of drinking beer with ice in the glass. I had a delicious boiling hot beef noodle soup in the market like I used to eat in my childhood days. If you want to see the famous American War history in Vietnam, the Museum of the Ho Chi Minh Campaign is well worth a visit. Beware that some images and recreations of the war prison are brutal and frank. Another museum is the Revolutionary Museum. We took the afternoon flight to Nha Trang. Recently I travelled to my country as a guest of our Vietnamese agents in Ho Chi Minh City to inspect and experience first hand our tours. I am writing as a client like you who will be escorted by our agents for your travel itinerary. I was travelling to 7 different places in 8 days and staying in hotels ranging from standard 2-3* to luxury 5* hotels. I hope this report will give you some idea what to expect when you travel to Vietnam with us.